Last week my daycare provider contacted me about being a reference or another potential family. One of her kids is getting ready to leave in the spring and interviews for the open spot have started. I couldn’t be happier to provide the reference since I am so happy with my experience in her caring for our daughter while we’re at work, pursuing our careers. I’m of the opinion that a mother should never have to choose between a career and a family. I have never wanted anymore more than to be a mother but I also feel like I have a lot to offer my community in my career. Life is about balance and for me that’s balancing motherhood and my job. With both my husband and I working, me four days per week, him five, daycare was essential. I already wrote about my process for choosing our provider but never talked about the positive experiences we’ve experienced since she started, 19 months ago. Our daughter is our only child. When she is home with us, she gets undivided attention which, as an only child, has its pros and cons. Other than her dad and I, she has no playmates at home. While we love playing with her, interaction with other children is crucial. I love watching her interact with her peers. I see natural qualities in her (like leadership and silliness) come out that I believe get masked at home playing with her much older parents. The fact that she gets to go to someone’s home and play with two other kids her age, four days a week, makes me happy. She has so much fun. No two parents, parent the same way. I enjoy having diversity in her upbringing. I like having an added variation in authority for her to get used to. Life will throw millions of different personality traits at her in meeting and dealing with new people, starting young can only help this. My husband and I don’t know everything. We’re first-time parents. The woman who is caring for her not only has two children of her own but has cared for many children over the years. She is far more experienced in parenting than I will likely ever be. I genuinely appreciate what her babysitter brings to the table in terms of her parenting abilities. She is a loving, sweet woman who cares for our daughter as one of her own, I could never thank her enough for this. Our daughter is in a safe, loving , environment where she is free to explore and learn, allowing my husband and I time to pursue interests of our own in our careers. For us this is a great balance. There was a time I was extremely reserved about sending her somewhere while I was far away from our home but I couldn’t be happier with our decision to send her to daycare. 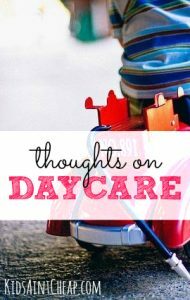 Are/were your kids in daycare? What was your experience like?